I am newly engaged- a lovely ring fell out of my Easter egg last Sunday! Very excited and considering an engagement party to kick things off.. Just wondered what peoples experiences were. Any great ideas? My one concern is that we are thinking about getting married aborad with just our families and then coming back to a reception here and I want a way to make sure that our wedding party is not too similar to the engagement party..
Any advice would be great- thanks! we got engagd on valantines day & we are having our engagment party tomorro, i cant wait lol. we had an engagement party and it was fab! but my h2b bless him tried to arrange it all himself and do it as a surprise! loads ppl turned up and it was jus a chance for every1 to share in our happiness and meet eachother! lots of fab photos, cards&gifts more than what we wanted, all we said to ppl was turn up and have fun! we are blessed to have great fam&friends roll on the wedding, so excited! we had a buffet at my H2Bs parents house with family on a sunday and hired a bar and had champagne and cupcakes with our friends. Got photographer in too to capture the moment! heres some pics if you fancy a peak! We had our engagement party in the same bar that we met. Luckily they had a private area that we hired and luckily it was nice enough to host our engagement party. The absolute bonus was that because they knew we met there (I made sure they knew) on the night they gave us 10 free bottles of champagne because we bought 100 poeople to the bar for the engagement party. Worked out superbly but I had i known we'd get some free champagne I would have ordered some more finger food. 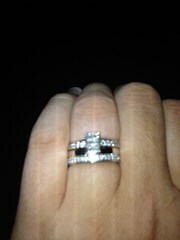 I got engaged on 26/03/10 & am having an engagement party on 7th May in the local bar. We have booked there function room & booked DJ & having buffet! So far I have bought lots of balloons & banners & I have a sneaky suspicion my mother is blowing pics of us up to put on the walls lol. Hiya, we had our engagement party in August. We hired part of a lovely country pub as the venue for our engagement party and it was fab! The weather was great, we had a function room and a large decked area outside too with fairy lights everywhere. I also made old fashioned bunting using pics from when we got engaged in Paris and strung them up with craft string and mini pegs. We had about 70+ guests and the whole thing cost approx £400. Just too much going on over the next few months. I am finishing medical school and starting my first job this summer, so graduation, holidays, weddings of our good friends.. Think we will opt for a family BBQ to celebrate grad/ engagement in the summer. We really want to get married next summer- there already seems to be so much to do. Feeling a bit under pressure to get a venue sorted- alot of them only have very limited availability for next summer- eek! We had a tea party in the garden. Spent a few days cooking macaroons and cakes etc with tea and champagne. It was lovely. We hired local rugby club (h2b plays so was actually free), so had a cash bar, put on a buffet and had the BMs dad as DJ - BIG MISTAKE. We had the worst night ever! DJ saw it as an excuse for a night out with the lads, got his wife and daughter to sing (they do this semi-professinally, but it was just too much for such a small setting). Guests ended up shouting over them for an hour and a half, and didn't want to dance to their choice of song. It took for my mother to have a right go at the DJ to get them to stop. Subsequently, BM has a go at me, because my mum had a go at his dad (goodness me, was like being 12 again). I then lost it with H2b for not sorting it all out properly in the first place. Nobody ate the food (waste of money) and some of h2b's work colleagues got so drunk it was embarrassing. Lovely way to start planning for a wedding..
Ah crikey- Biggs2be you poor thing. At least you've probably learnt loads about party planning for the real thing! Better for it all to go wrong on the engagement party than the wedding day!